Last month, I took a little road trip to Round Top with the hopes of eating for the first time at Royer's, but they were closed because it was the week after the big market. 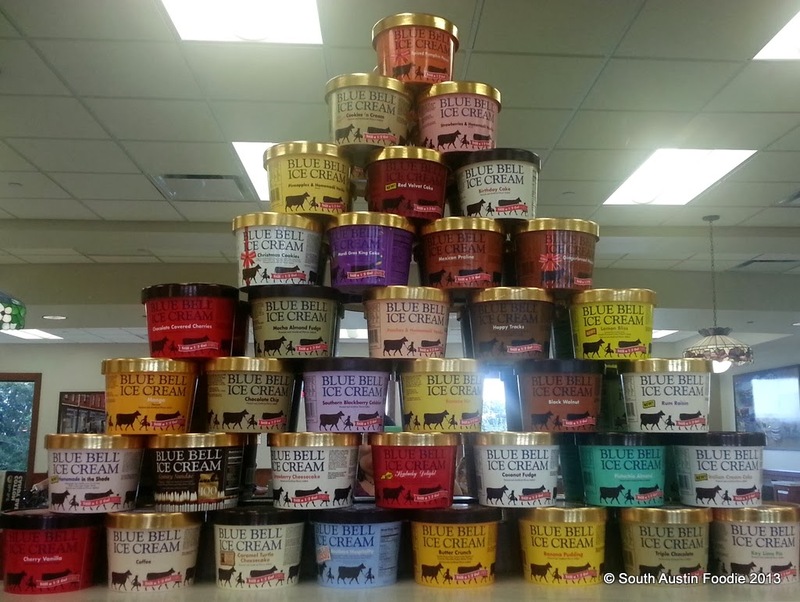 And so we continued on to Brenham, to go to the Blue Bell ice cream plant! Now can you believe I was with some NATIVE Texans, who had never been there before? Heck, I am East Coast girl, and I had even been once before, many years back. Anyway, we had a blast. And I learned from our tour there that Blue Bell was the very first company to produce a cookies and cream variety of ice cream. Originally they used Oreos, but they eventually switched to making their own cookies. And employees can eat as much ice cream (or other Blue Bell products) as they wish when they are on their break! My mint chocolate chip was refreshing and delicious! I drive past this convenience store/burger spot all the time on South Lamar. 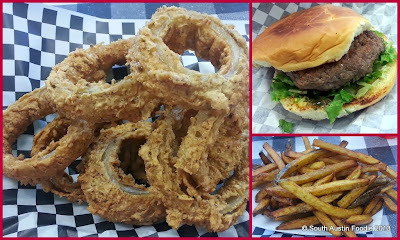 Wholly Cow uses locally sourced, grass-fed, hormone-free beef from a farm in Fredericksburg, and also has many vegetarian, paleo and gluten free options. I had the burger and onion rings, and my friend the cheese steak and fries. Look at those gorgeous onion rings! It was a huge pile, and they were fried really well..... but I think they are using a gluten free batter, because there was no crispness to them. (I did try asking about the batter, but the guy at the counter was a rather evasive...) The burger is served on a King's Hawaiian Sweet Roll, which I like; the burger itself was fine, but I wouldn't say there was anything majorly special about it. The fries unfortunately weren't a whole lot better; they too look like they'd be great, but they were undercooked, and rather starchy in the middle. Overall, a bit of a disappointment for me, but my friend really liked her cheese steak. 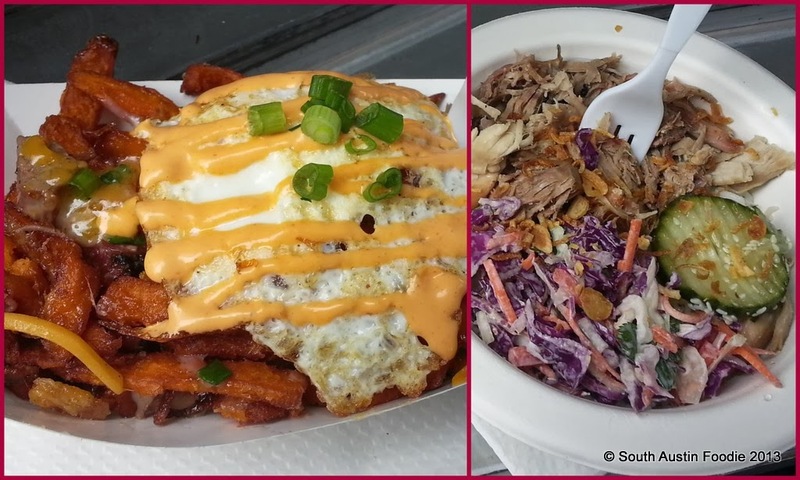 The Texas Book Festival had a barbeque food court, and the Peached Tortilla trailer was serving items featuring brisket from Miller's BBQ. I had the sweet potato fries, with brisket, fried egg, and sriracha mayo, and it was pretty darn tasty. The meat was really nice, though it could have used more brisket; I would order this again if I came across it. My friend had the pork bowl with wasabi slaw, pickled cucumbers, and rice; I didn't try it, but it looked good, and he ate all of it. Tucked away by the Target on South Lamar and Ben White is Dong Nai, a Vietnamese place with some Chinese food options as well. It's been probably 2 years since I've been here, even though I've always liked it. They've changed their decor a bit, removing the booths along one wall in favor of regular tables. The chairs at our table though were on wheels which was a little odd for a non-carpeted environment. Prices have always been good, and food comes out quickly. Their pho has always had a wonderful broth, very aromatic. 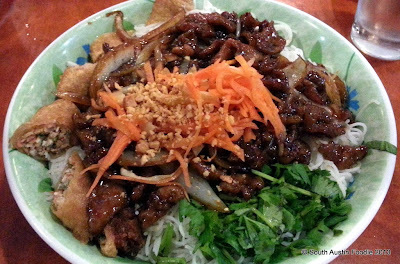 I am partial to their vermicelli, or bun, bowls, particularly the char grilled pork. It looked great, and everything was very fresh, but the pork wasn't as flavorful as I remember it to be. Hopefully it won't take me two more years to return. On East Cesar Chavez between Chalmers and Chicon, you'll find the Veracruz All Natural trailer alongside Kerlin BBQ. My friend and fellow blogger Mad Betty is crazy about chilaquiles, and she had learned that on the first Sunday of the month, Veracruz serves them as a special. 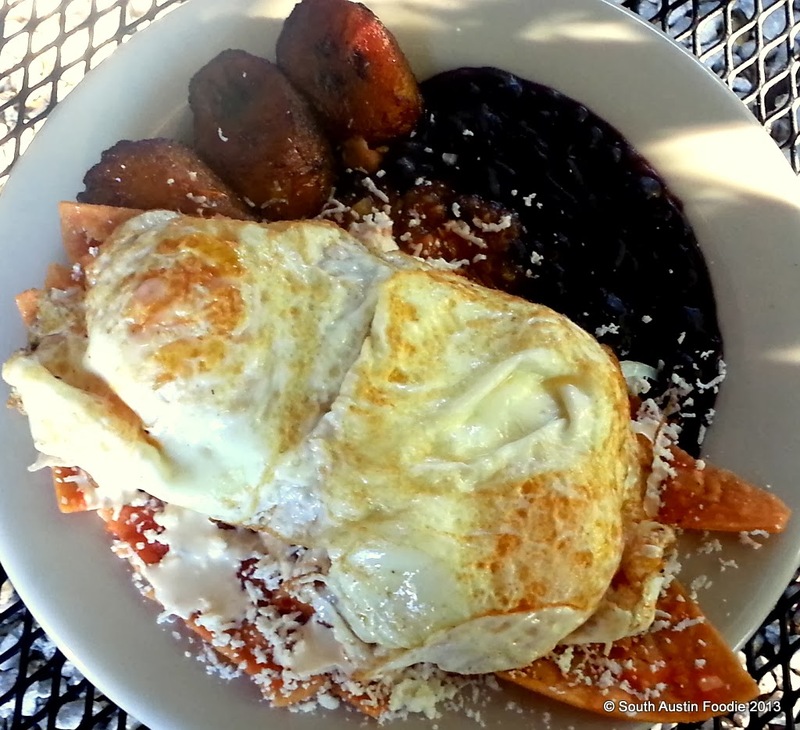 I was prepared to get the chilaquiles too, and figured one of us would get with red sauce, and the other with green. 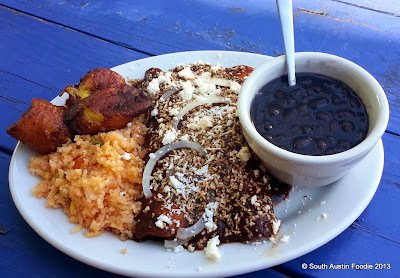 However, when I saw they were offering chicken enchiladas with mole for breakfast, all bets were off. You know I've been a on quest to find Austin's best mole, right? (And if you have suggestions, PLEASE leave them in the comments below!) I LOVE a traditional Oaxacan mole (aka mole coloradito, made with chiles, nuts, raisins, chocolate....), and I rarely pass up the opportunity to try a new one. These were nice fat chicken enchiladas, with mostly shredded white meat. I could have lived without the raw onion slivers, but the fried plantains with their caramelized edges made up for it. And the mole sauce -- overall, not bad, though not my ideal. It was a thinner sauce in body, and was heat-forward, meaning the chiles were pretty much the first thing I tasted, and I didn't get the depth that I should get from the other ingredients, but still tasty. Plus this stunning plate was only $8.50. I've been to brick and mortar restaurants who have served smaller portions for twice the price. And, for a food trailer, notice they are using REAL plates! I had a taste of the chilaquiles (with red sauce) which were quite good, and Mad Betty seemed very pleased. Check her blog, as I am sure she'll be writing it up soon. 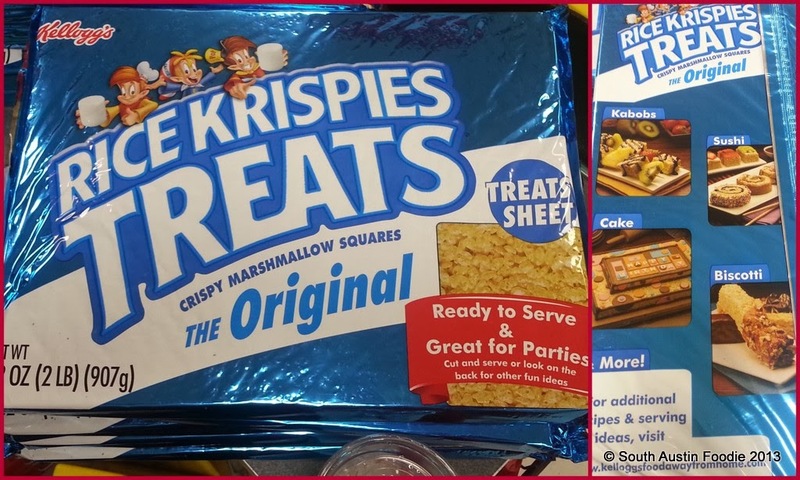 The local 7-Eleven had a two pound Rice Krispie treat! And they even had "recipe suggestions" on the back! I am not even that big of a fan of these things, but I just marveled at the sheer size of this thing, and think it's pretty genius, especially for those who can't make their own. Though I think for the cost of $11.99, you could make two batches. 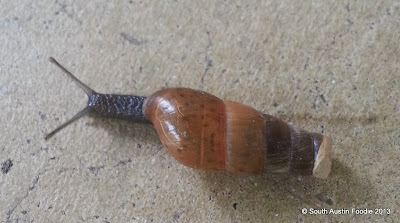 And finally, all the recent rains brought a bounty of snails to my front porch (seeking higher, drier ground, perhaps?) Escargot, anyone? It's been awhile since I've been to Wholly Cow. I'd heard everyone rave about the candied jalapenos so I got them on my burger. Emphasis on the candied, they were so sugary sweet that they ruined the burger for me. Eww, that's a bummer. This is the kind of place I really want to see do well, but neither of our experiences bode well! I've been itching to try Peached Tortilla. It looks sooooo delicious!